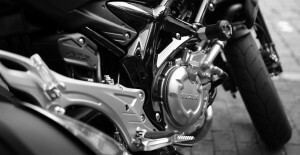 A motorcycle engine will fail miserably if its oil is not changed regularly. The typical standard for changing it is usually after 5,000 miles but check your owner's manual in case your model varies. If your bike doesn't have an odometer, you can measure the maintenance intervals with an hour meter instead. When you change your oil, changing your oil filter at the same time will keep it fresh and can keep you from having to change it at a different time which will require you to do the drain again. It is possible to change your oil without replacing your oil filter but it'll probably only cause you more maintenance later on. It's important to make sure you have all the tools you'll need before you start to get to work. Once you've got your engine oil, check out your engine and where the oil filter housing and drain plug are in order to gather the right size tools to disassemble and reassemble them. You'll also need a new oil filter, a drain pan, a funnel, and a drain bolt crush washer. You can either mount your bike on a stand or just allow it to rest normally with the kickstand down. Just remember that the angle at which your bike is sitting will affect how the oil will flow out of your engine and you'll need to place your drain pan accordingly. Make sure that you are changing your oil in an area free of dust, dirt and other contaminants. If even the smallest piece of sand ends up in your oil, it can wreak havoc on your engine. For this same reason, use clean tools as well. Check your motorcycle before hitting the road. You want the best synthetic oil in Houston. Call ADR Oil Company at (832) 445-7530. ADR Oil provides premium AMSOIL Oil in Humble. They're here to help you find the right synthetic products and handle all your synthetic lubricant needs.